I'm a Melbourne-based writer and traveller with a passion for good food. If you love bashing away at a touchscreen, be it on your smartphone, tablet, kindle or otherwise, then look no further – China Red is the place for you. With the exception of a few (and in my opinion, deprived) tables, a bright computer touchscreen menu is mounted on the wall in front of or beside you. Forget those awkward attempts to flag down busy waiters as they race past. 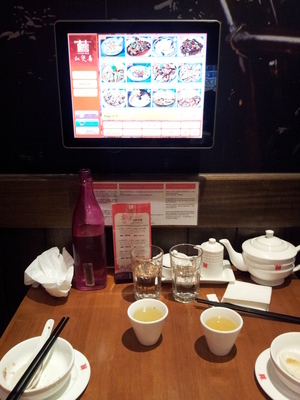 At China Red, your meals – and the staff – are literally at your fingertips. 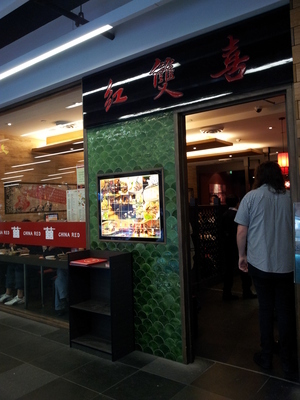 Sister restaurant to the better known Hutong Dumpling Bar, China Red is the first restaurant in Melbourne to have tapped into the touchscreen ordering system. The computer menus are easy to use and simple to navigate. Food and drink are organised into categories, accompanied by bright and colourful pictures for each item. All you have to do is select your dish, the quantity, and confirm. Easy. But ye be warned: once you have made your order, you're stuck with it. No changes or cancellations can be made once it's confirmed. However, if you are a slightly fussy eater or suffer from food allergies, you must inform the staff of your requirements before you order the dish. Other useful touchscreen functions include checking your order (a handy way of keeping an eye on the damage to your wallet), requesting the bill, and calling for the staff. Personal service is not entirely done away with though. The staff at China Red can be found roaming the restaurant, just in case you need a hand. Like most of Melbourne's quirks and oddspots, China Red is hidden in an unassuming arcade connecting Bourke Street to Chinatown. The restaurant's sleek and modern furnishings are spread over two levels. At the entrance upstairs, dumpling maestros can be watched through the kitchen window as they work their wonton wizardry. 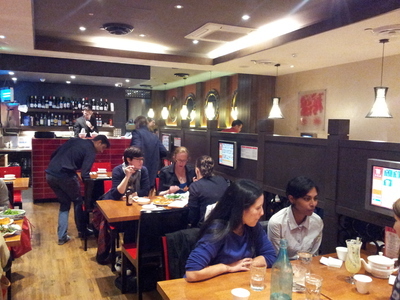 The comfy booths downstairs can seat larger groups (although not everyone can access the touchscreen menu, which is disappointing), and there is a private room at the back that can fit a group of 12. The food at China Red is decent, but pricier than your average cheap Chinatown restaurant. Meals to share are the go here, rather than individual dishes. 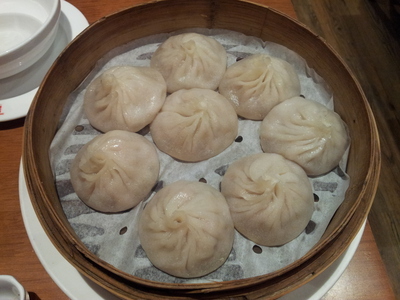 Try the famous xiao long bao – steamed pork buns filled with soup, delicately encased in a translucent dough – which is one of China Red's specialties. 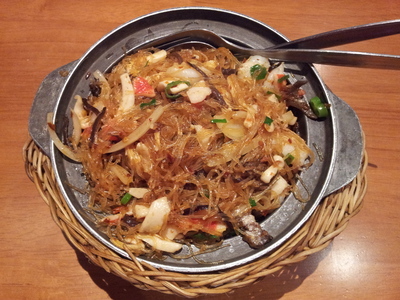 Other favourite dishes of mine include the combination seafood claypot, the pork wontons in spicy sauce, and the Singapore fried noodles. And if you can handle your spice, there are also plenty of Szechuan options for you to choose from. An extensive dessert menu also awaits if you have room. And if you like mango, coconut or glutinous rice, then you are in good hands. China Red apparently has dinner sittings: one at 6:30pm (to finish by 7:45pm) and the second at 8pm. However, these "sittings" do not appear to be strictly enforced, as I have been known to rock up at any time and leave pretty much whenever I've felt like it. Whether or not you like China Red will basically come down to personal taste and preference. Cheaper, better quality food can probably be found elsewhere in Chinatown, and those that prefer a more personal touch (in a non-touchscreen kind of way) to their service may not find it their cup of oolong tea. But to all those sceptics, I say come not for the service. Or even, dare I say it, the food. Come instead for the experience, and the sheer novelty of being able to click for your dim sum. Most of the better Asian restaraunts are slightly pricer. Think flower drum and laus family kitchen which I can highly recommend. Personally I don't find price the problem. This place is a gem. Been a few times and never had a bad meal. Definetly try the Chinese broccoli. One of the best I've had.